Picture this… It’s 1968 in a remote fishing village in eastern Canada. A six year old boy comes home from an afternoon jigging tommy cods on the wharf. He carefully drops the needle on “Rubber Soul”, his parents only Beatles album, adjusts his headphones and starts jamming to Ringo on his toy tin drum. These are the humble beginnings of what has become a great musical adventure. After a string of school concert bands, a Diploma in Jazz Studies and a Bachelor of Music from St. Francis Xavier University, Scott Ferguson has gone on to live his musical dreams. In the early 80′s Scott focused on his jazz passion studying with renowned drum teacher Jim Blackley in Toronto and performing with such greats as Oliver Jones, Peter Appleyard and Dave Young. 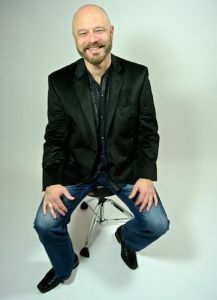 Settling in Halifax, Nova Scotia, Scott broadened his stylistic scope and in 1992 embarked on a seven year tenure touring and recording with “The Rankin Family”. After hundreds of concerts in Canada, The United States, The U.K. and Australia Scott started pursuing his interest in studio production. Fueled by his work with legendary Nashville producers George Massenberg and John Jennings on the Rankin CDs “Uprooted” and “Endless Seasons”, Scott started “Ferguson Music Productions Inc.